is our latest challenge at Fashionable Stamping Challenges. I had some serious fun with this one! Shirley (industrious leader at FSC) and I had a rare Skype-crafting session where we just played and got messy. Good ol’ fashioned fun. And this canvas is the result. My first one! You can see Shirl’s project here. It is so funny when people are creating together and then what they come up with are poles apart. We all see this when we do classes or workshops. And this is exactly what happened this time. Thanks Shirl…it was so much fun! It just goes to show that you can work around time zones…that anything is possible if you want it to be. I can’t wait to do it again. Inspiration for this is from a recent day of workshops with Finnibair who is on tour in Australia and New Zealand at the moment. Luckily she was touring within a few hours of where I live and couldn’t resist the opportunity to go and play. My canvas has lots of layers in the background, and even more on the top. Finally the idea of layers is starting to make sense to me…lol. The background has dimension from modeling paste, ribbon, paper and hessian. And the top is just anything I could lay my hands on really. Maybe I went a little over-board with the shimmer spray…well, why not! It was sooo much fun!!! It isn’t a work of art, more like a ‘work-of-fun’. All in all, I am more than happy with how my early attempts at working on a canvas has gone and I am keen to give it a go again real soon…especially as I am now on Summer holidays! I love this stamp set and am keen to experiment some more with it. The stamps were bought on the day and worked beautifully on this canvas. They were stamped onto tissue paper and then placed where I thought they should go. I have learnt that canvas’s aren’t that scary after all (most of the time). Love, love, love it. I am definitely getting more spray inks for the next time. Everything looks all floaty and mystical plus the way the light shines around her is amazing. Going to check out those stamps as well. Thanks for a brill time and also giving me the confidence to get messy … lol. This is such a fabulous canvas and you can tell you enjoyed the process. 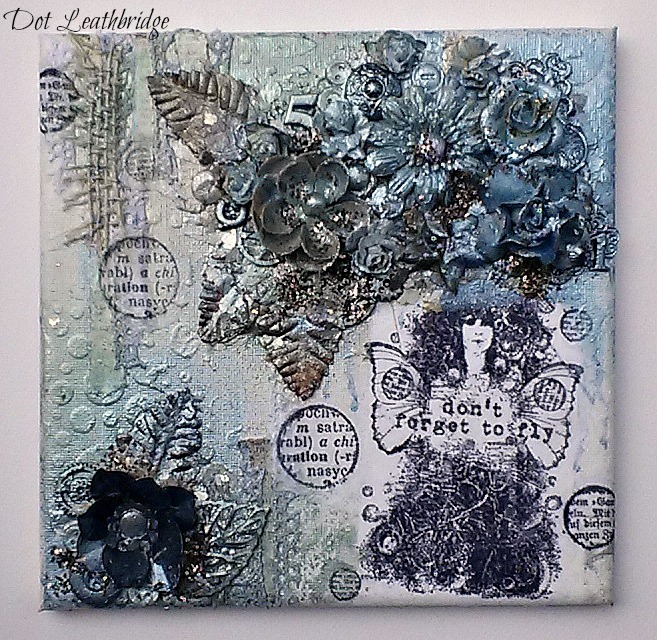 Love how you've built up the textures and embellishments – looks like you didn't forget to fly with this one. WOW WOW WOW, this is absolutely beautiful. Great!!! wow i love your finnibair style!!! It looks fantastic!!! Oh my word – what an absolute showstopper of a creation – I'm open-mouthed! Finn style suits you! !